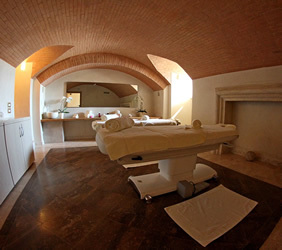 Thanks to the mineral hot springs which have been discovered during the renovation of the Castle, a unique Spa has been created. Our Spa guarantees to our Guests an unforgettable wellness experience, giving the feeling of being dreaming among green hills and vineyards. The choice of treatments is wide: facial and body massages, scrubs and many further cuddles using the best natural products. A relax oasis: 2 outdoor and 2 indoor pools ( one of each area with Jacuzzi), all of them featuring mineral water from the underground hot springs of our property, 5 individual and 1 couple treatment rooms, steam bath and sauna, emotional showers. The new Spa rooms ( 19 in total) offer the same mineral water also in the bathtub, and for the guests who wish to have their private intimate Spa, there is no better choice than some of our Spa Suites, featuring an individual treatment room with separate entrance.